My adventures in yachting got off to a rich start. A “SAIL” magazine subscription card, with a questionnaire at the bottom, was my launch ramp. I checked the box indicating my net worth exceeded $10 million (I felt like $10 million just checking that box). I also checked the box indicating that I was interested in purchasing a new boat in the next six months (I was, in fact, interested. Very interested). Not long after dropping that little card into the mail, I started getting invitations to all sorts of exciting events. I would need my parents to drive me to all of them because I was only 12 years old. First stop: the yacht brokerage office. A man there had written to tell me about a boat that was winning races up and down the coast that I just had to see to believe. That man, I remember, spent a lot of time talking with my father, which annoyed me. I was the one with the questions and it was me, after all, who had received the invitation. At about a mile long and two feet wide, the boat was indeed a glorious, lean racing machine. The man explained the many features of the boat. The engineering of the hull around the mast step was of particular interest to me. The man said it had a “tri-axle” radial force grid that enabled it to withstand immense mast compression loads. It looked solid. A couple of weeks later, Phil Weld invited me to the Ritz Carlton in Boston to chat with a few of his friends about his recent victory in the singlehanded trans-Atlantic O.S.T.A.R. race aboard his trimaran Moxie. Dad said it was the first time the family Jeep got to enjoy valet parking. The meeting room had a fine view of the Boston Public Garden. In an effort to put my best foot forward I donned my finest clothes (my marching band uniform), and I felt good walking in. It turned out Mr. Weld planned to build a bigger boat for his next race and was optimistic that this particular group of friends would pitch in a few dollars to help with the project. Up went my hand to my mother’s horror. “Would this new boat have a ‘tri-axle’ radial force grid?” I wanted to know. Mr. Weld assured me that it would if it needed to. Completely satisfied with that response, I rested back in my chair with a slow, satisfied nod of my head. These were my people. And now they all knew that I understood the importance of anticipating mast compression loads. I went home with an autographed copy of Mr. Weld’s book. In the inscription, he encouraged me to maintain an open mind and champion unballasted boats. The third stop on what my parents called the “Yacht Tour” brought us to an expo on the new-fangled sport of windsurfing. I got to spend the better half of the day out on the water learning to work the contraption. Like a mechanical bull on the water, it felt like it was designed to throw me and stomp me and make me look inept. I loved it! By sunset, I had it somewhat figured out. A moment arrived when, with straight arms, my weight found where it needed to be and an effortless balance was attained. I shot across the water at astonishing speed and was hooked. At the time, I had a job picking raspberries and another job picking weeds. 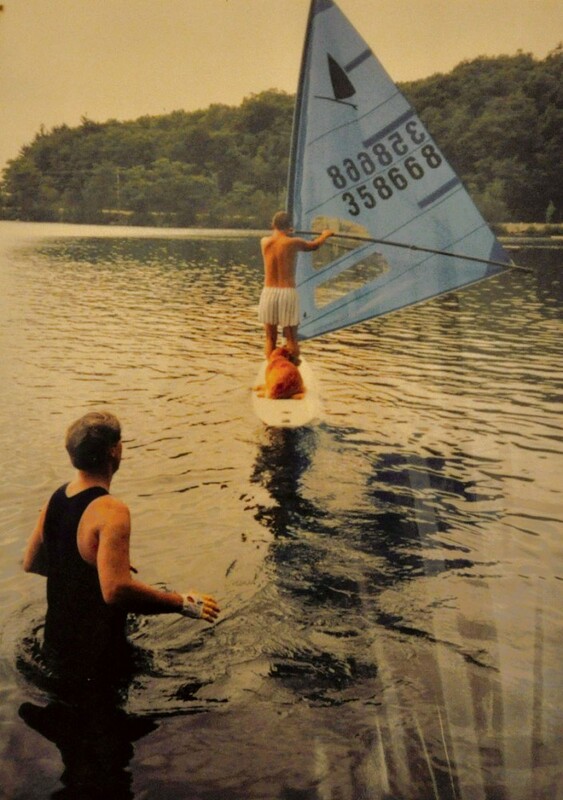 My enthusiasm for windsurfing was infectious and my father wanted in. 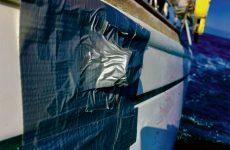 By the end of the summer we were co-owners of our first yacht, the original Windsurfer with a blue sail. I remember her maiden voyage well. Bursting with pride, I set off on a nearly calm morning on a very still Dublin Lake. The simple facts of the case delighted me. I had picked enough raspberries and weeds to become a yachtsman and said-yacht was now sailing across the New Hampshire lake under my command. I was boat-struck. I loved her speed. I loved the challenge of learning to control her. 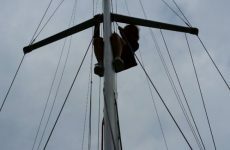 I loved the independence of sailing my own boat. I still love her awkwardness. There have been other boats since; and the funny thing is, that I have loved them all for those very same reasons. The original Windsurfer was simple and completely full of everything a boat can be. She didn’t have a “tri-axle” radial force grid, but I didn’t care in the slightest. 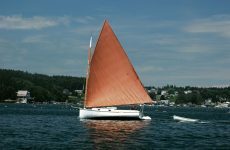 Christopher Birch is the proprietor of Birch Marine Inc. on Long Wharf in Boston, Mass., where he’s been building, maintaining and restoring boats for the past 34 years.